It is astonishing to consider that the Bombay Gin editorial staff is putting the finishing touches on issue 38.2. Yet, before we look forward to our June 10 release party and the 2012 Summer Writing Program, the end of the semester brings us yet another opportunity to raise some money, this time for both the journal and the Women’s Bean Project, an organization that helps women break the cycle of poverty and unemployment by teaching them job readiness and life skills for entry-level jobs through employment in their gourmet food production and handmade jewelry manufacturing businesses. 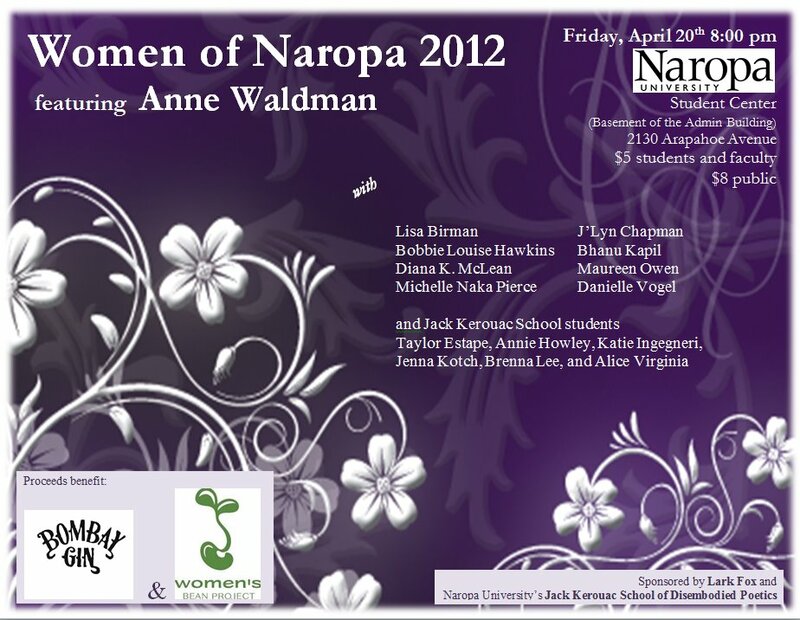 Each spring semester, the generous Lark Fox, an alumna of JKS, works with Bombay Gin and JKS to organize the Women of Naropa reading. The wonderful Anne Waldman will read as well as Lisa Birman, Bobbie Louise Hawkins, Diana McLean, Michelle Naka Pierce, Maureen Owen, Bhanu Kapil, J’Lyn Chapman and Danielle Vogel and current Naropa students, including our very own Alice Virginia and Katie Ingegneri! Please join us this Friday at 8 pm in the Goldfarb Student Center: $5 for students and $8 for non-students. All the proceeds will go toward Bombay Gin and the Women’s Bean Project.